Vitamins are essential for normal metabolic functions including hematopoiesis. The B-complex vitamins are necessary for the conversion of carbohydrate, protein and fat into tissue and energy. Methyl cobalamin is one of the two-coenzyme forms of vit. B12. Evidence indicates this form of vit. B12 in addition to having a theoretical advantage over cyanocobalamin actually has some metabolic and therapeutic applications not shared by the other forms of vit. B12. Methyl cobalamin, and will highlight the potential therapeutic relevance for Bell’s palsy. cancer, diabetic, neuropathy, eye function, heart rate, variability, HIV, homocysterinemia, male-impotence and sleep disorders. Folic acid water-soluble vitamin in its fully reduced form (Tetrahydrofolate, folate serve as a 1-carbon for synthesis of purines and pyrimidines as well as in the remethylation cycle of homo-cyst to methionine. Folic acid is a complex vitamin after absorption from the gastrointestinal tract. Folic acid is hepatically converted to tetrahydrofolic acid, which is a cofactor in the biosynthesis of purines and thymidylates of nucleic acids. An exogenous source of folic acid is necessary for the maintenance of normal erythropoiesis. (Its deficiency can lead to meagloblastic and macrocytic anemias as a result of impairment of thymidylate synthesis). Pyridoxine- dependent seizures an autosomal recessives trait, result from a defective binding of pyridoxine to its apoenzyme, glutamate decarboxylase, the apoenzyme catalyses the conversion of glutamic acid to gamma aminobutyric acid (GABA) which acts as an inhibitory neurotransmitter in the central nervous system. Seizure threshold is lowered in infants with reduced concentrations of GABA. ONSET OF ACTION 4 hrs. Of age. The seizures generally stop within 2-3 min. following administration. Venous irritation, pain, nausea, headaches, irritability, profound sedation. Known hypersensitivity to vit. B6. Menol is contraindicated in patients known to be hypersensitive to any of its components. General certain conditions listed above may require additional nutritional supplementation. During pregnancy, for instance, supplementation with fat-soluble vitamins and minerals may be required according to the dietary habits of the individual. 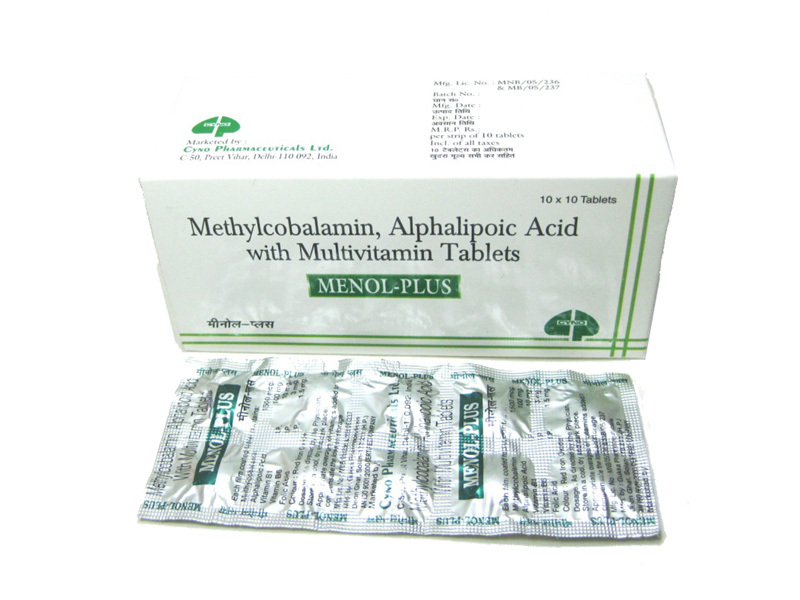 MENOL-PLUS is not intended for treatment of severe specific deficiencies. Information for the Patient: Because toxic reactions have been reported with injudicious use of certain vitamins, urge patients to follow your specific instructions regarding dosage regimen. As little as 5 mg pyridoxine daily can decrease the efficacy of levodopa in the treatment of Parkinson’s. Therefore, MENOL-PLUS is not recommended for patients undergoing such therapy. Usual adult dosage: one tablet daily. (1) Diagnosis and treatment of pyridoxine dependent seizures. (2)-Prevention and/or treatment of vit. B6 deficiency. Menol-plus is indicated for supportive nutritional supplementation in conditions in which water-soluble vitamins are required prophylactically or therapeutically. These include: Conditions causing depletion, or reduced absorption or bioavailability of water-soluble vitamins – Gastrointestinal disorders, chronic alcoholism, febrile illnesses, prolonged or wasting diseases, hyperthyroidism or poorly-controlled diabetes. Conditions resulting in increased needs for water-soluble vitamins – Pregnancy, severe burns, recovery from surgery.